Lorenzo Chavez enjoys working in both pastel and oil. Lorenzo participates in several national invitational and International group exhibitions including the Pastel Society of America in New York, Pastel Society of Spain, Pastel Society of France, Artists of America Show in Denver, Rims to Ruins Exhibition, Plein Air Painters of America, Albuquerque Art Museum, Maynard Dixon Country,100 Gold Medal Exhibition at The Pasadena Art Museum, Panhandle-Plains Historical Museum, Bradford Brinton Museum, Coors Show in Denver, Butler Art Museum, Laguna Art Museum, Gilcrease Museum, Legacy Gallery, Cape Cod Art Museum, Blue Rain Gallery Santa Fe, Helena Fox Fine Art, Charleston, SC and Settlers West Gallery in Tucson, Trailside Galleries. He was featured in a successful one-man show at the C.M. Russell Museum and has participated successfully in several C.M. Russell Art Auctions. Articles featuring Lorenzo Chaves have appeared in Southwest Art, Art of the West, American Artist Magazine, Plein Air Magazine, Artists Magazine, Western Art Review, American Art Review, Pastel Journal, and Denver Post. 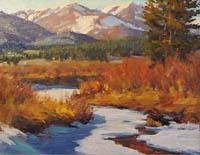 Five new books feature his art, including: Colorado Landscapes, Pure Color: The Best of Pastel and Plein Air New Mexico. Lorenzo is a nationally known workshop instructor who has taught numerous workshops across the United States since 1993. Lorenzo is represented in many private and corporate collections both nationally and internationally.